"You always want to win. That is why you play tennis, because you love the sport and try to be the best you can at it." 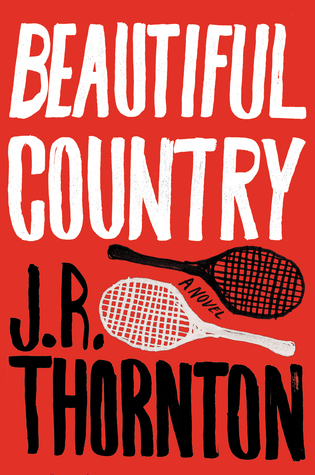 J.R. Thornton, An internationally ranked junior tennis player, pens his debut novel, Beautiful Country that narrates the story of a young boy in a new country-Beijing, all by himself, to get trained under best and strict tennis coach so that he could be ready for the international championships. But when friendship comes before Tennis, he needs to make a terrible choice to protect either the people or the things he love. Chase, a 14-year old top ranked junior tennis player in the U.S, arrives in Beijing to be trained with the best Tennis team of the city. That is when Chase meets a Chinese boy named, Bowei, who helps him solve his language barrier problem and together, they explore an enlightening oriental journey that opens their minds about the constantly shifting Chinese culture, politics and the economy. But when Chase has to make a difficult choice, he is left with no option to protect his friendship beyond all the cultural indifference and the harsh rules of an equally strict Tennis coaching and practice. Being a young debut author, the writing style is extraordinary and is laced with emotions and vivid and in-depth layering. The narrative is highly engaging enough to keep the readers glued till the very end. The story is written in a way that it will immediately arrest the readers mind. The pacing is moderate as the author pens each and every details vividly. Written from a personal experience, the author has diligently captured the city of Beijing from its landscape to the people to its changing culture and changing socio-economical dynamics. And it is bound to make the readers experience a first-hand taste of this changing oriental city. The characters are drawn from realism and are extremely well-developed. Especially, the main character,Chase, considering his tender age, He is level-headed and being alone in a different country, he behaves quite maturely. Chase's friendship and his bond with the new friends is amazing and really strong, despite there is a huge language and culture barrier. The supporting cast are also very well-etched out. Overall, this is a fascinating story about moral values, hard-work, dedication and inter-culture friendship that is both illuminating as well as captivating. Courtesy: Thanks to the author, J.R. Thornton, for giving me an opportunity to read and review his book. J.R. Thornton graduated from Harvard in 2014 where he studied History, English and Chinese. An internationally ranked junior tennis player, he later competed for the Harvard men’s team and on the professional circuit. He lived in Beijing as a teenager, returning recently to undertake a fellowship at the International Writer’s Center at Beijing Normal University. Beautiful Country is his debut novel.